Unit 3 - European Civil Wars - The rise of nation states: how did religious difference lead to wars? Key concepts: Reformation, structure and agency, martyr. Key skill: Source analysis, cinematography. Tristam Hunt's four part BBC documentary series of the revolutionary consequences of the Protestant Reformation. What happened when Martin Luther's ideas spread across Europe? Key skill: Debatable essay questions. Lesson 2 - Reform or revolution? Church or state? Janina Ramirez tells the story of three books that defined this radical religious revolution in England: Tyndale's New Testament, Cranmer's Book of Common Prayer and Foxe's Book of Martyrs. How did Catholicism fight back? Why was Calvin so important? Lesson 3 - Counter-Reformation and Calvin. As part of our work on the Reformation we will also be visiting the International Museum of the Reformation in Geneva. More on the Spanish Inquisition in 15 minutes from the University of Texas. How were nation states formed, why did they go to war against each other and why was this important? Key skill: The philosophy of identity, understanding the 30 Years' War! On the rise of nation states see this excellent short overview by William R. Bowen or this diagrammatically supported account from the Flow of History. Why did the Dutch (and the British) become so rich in the 17th century? What are some of the inherent problems of capitalism? Key concepts: Capitalism, Baroque, Scientific Revolution, secular, multinational corporations, shares, monopoly, triangular trade. Key skill: PESC, cause and consequence. The new 2018 BBC Civilisations art history series contains a number of beautiful episodes. This is one of the best and really excellent on the world's first globalisation. This is a rather beautiful introduction to art in the Dutch Golden Age. Lesson 6 - Scientific Enlightenment and Enlightened Despotism. Probably the most readable books on the history of the scientific revolution are Dava Sobel's Longitude, the story of John Harrison an English clockmaker who solved the problem of how to measure longitude at sea and Galileo's Daughter which brilliantly captures a relationship and time: plague, Thirty Years' War and the Medicis. Longitude was also made in to an outstanding TV film. 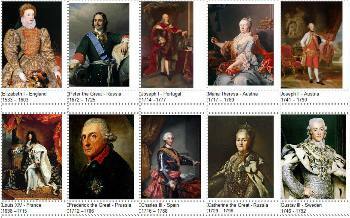 monarchs of the 17th and 18th century.